At long last we're able to get this Encyclopedia up online. It's created with David Joffe's dictionary compilation software TshwaneLex, and it's a labor of love on the part of my good friend Gilles-Maurice de Schryver. We are very grateful for their generous donation of talent, time, and dedication. Thank you, folks. 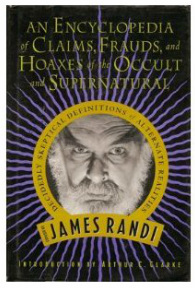 When I decided to place the entire text of "An Encyclopedia of Claims, Frauds, and Hoaxes of the Occult and Supernatural" on the Internet, it was suggested to me that this could cut into the sales of the printed version. However, experience has shown that, in the publishing business, making a book available on the Internet only stimulates sales of the actual book! Another mystery. I'm very pleased that we're able to do this for our readers, which reminds me that I must thank a good number of you for sending me corrections that needed to be made. You know who you are. Many of the errors were ones that I should have spotted long ago, and there were quite a few typographical errors — especially in the index. As with all of my books, I dropped in a few jokes. I had a hard time getting these jokes accepted by St. Martin's Press, the original publishers. However, now that it's on the Internet, I not only can make sure that the full force of my wit is felt, but I can add new ones in response to my latest whims. Seriously, if you find errors here, I urge you to notify me and they will be promptly corrected. I must tell you that there is also a UK edition of this book, titled, "The Supernatural, A to Z." It was very interesting for me to compare the two editions, especially in view of the differing "sense of humor" we find in the UK. As an example, in the entry under "succubus," the UK edition omitted everything following the word "Nahemah," apparently finding it too difficult to believe. This Internet version will contain many more illustrations than the printed one, and as time goes on we intend to add more categories and definitions, as well. If you have any suggestions along this line, we invite them eagerly. Please be sure that what you offer us is "in tune" with the subjects we handle, and when possible, give us a reference for the item. This online edition replaces the previous one of Stephen J. Goodson, to whom our sincere thanks are also due. Thanks too to Sean Schricker who proofread the initial batch of data that was imported into TshwaneLex. I hope that you will enjoy this Internet version, and will return to it often for information, entertainment, and perhaps for research purposes. You are free to quote from it, providing full source credit is provided.